Except for when they bloom, Thanksgiving and Christmas cactus all look alike, right? Well, not exactly. 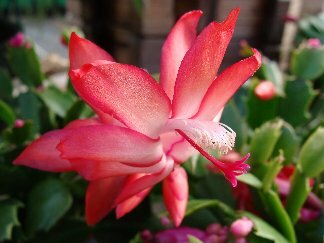 Both belong to the genus Schlumbergera which is a genus of rock dwelling cacti native to the rainforests of Brazil, and both are known as holiday cactus. That’s where the similarities end. Their names, Thanksgiving cactus and Christmas cactus are derived from the holiday closest to their blooming periods. To confuse the matter a little more, there is also a Spring cactus, or Easter cactus that belongs to an entirely different family Hatiora gaertneri. However, the plants are distinctly different. Without going into too much horticulture-speak, let me break it down into simple terms. Thanksgiving cactus are Schlumbergera truncata and the easiest way to tell them apart is that the edges of their flattened stem segments resemble a crab’s claw. The leaf margins will be pointed like hooks or claws. When grown under normal light conditions, these plants bloom on or around Thanksgiving. True Christmas cactus are Schlumbergera bridgesii and they are easily identified because they have smoother, rounded edges to their stem segments. They will bloom closer to Christmas and can sometimes be difficult to find to buy. Easter cactus, or spring cactus begin to bloom around February and sometimes will bloom again during the summer months. All holiday cactus come in a variety of colors ranging from white to pink to magenta to red, and you may even find some that are yellow or bicolor. There has been a lot of breeding and hybridization over the years to change the colors from what you remember in your grandmother’s windowsill from long ago. As a matter of fact, many people take cuttings and the same plant has been known to survive throughout many generations from cuttings from a grandmother’s or mother’s original plant. They are very easy to propagate. Care for these plants is fairly simple and they are great houseplants. Keep them in a bright, sunny location but not in direct sunlight. Keep them away from hot air – they’ll bloom better in a place where temperatures are in the 50-55 degree range at night and the 65-70 range during the day. Don’t over water- they are cactus and don’t need a great deal of water, especially during November and December. You may experience bud drop if they are exposed to drastic temperature, light or moisture changes. If you have one from previous years that you’d like to have flower again, you’ll be surprised to know that these cactus are similar to poinsettias in that they are thermo-photoperiodic meaning they have specific light and temperature requirements in order to set buds. They need six to eight weeks of exposure to nearly equal dark and light conditions and lower (50-60 degree) temperatures. For most people, this is accomplished easily by putting them in a room that is not in constant use in the evenings thereby creating natural daylength. Individual blooms will last a week or more, but the plants are often so prolific that the show can easily last for a month or more. Enjoy your holiday cactus this year now that you know the clues to solving the mystery of which one it truly is! Thank you so much for solving the mystery for me. I have a Thanksgiving cactus and I just thought it’s timing was off. Now I know it’s timing is perfect and my information was off. I’ve had it for at four years and have managed not to kill it so it’s definitely a keeper for me. By the way, I really enjoy your monthly newsletter. Thanks for sharing and Merry Christmas. I combined two of my mom’s “Christmas” cactus in one pot and one blooms at Thanksgiving and the other blooms at Christmas! 🙂 Now I know why!! Great article! Thank you for your message! Merry Christmas!